It looks like there is some interesting programs on PBS tonight, so I think some more stitching may be in order. Slow stitching is happening today, and lots of it. It’s a lazy, lazy day today, with not much happening. I had though we were having family over to visit, but it turns out that what I thought was a definite statement that they were going to be here was just a maybe we can try to come over. That wasn’t their fault, it was my fault for misreading it. So, what’s a quilter to do when presented with a free and clear day....... quilt. 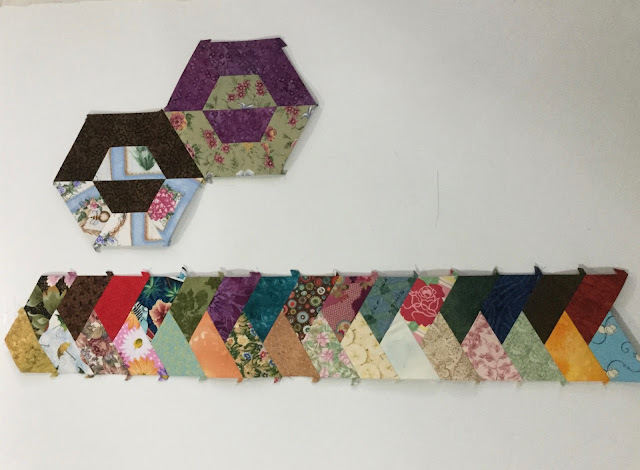 A couple of weeks ago I started making a braid out of some 2 1/4 inch half hexagons. I had no idea at the time, what I was going to do with it, other than I liked the way it looked. I did some research and some image searches on the internet to see if I could find something that inspired me for arranging long lengths of braids. Nothing really spoke to me. But, after showing the picture on Facebook, I had numerous comments that it would make a great border. Hmmmmm..... so it would, but a border for what? Well, I saw a picture of some hexagons made of half hexagons, and I decided “that’s it!”. 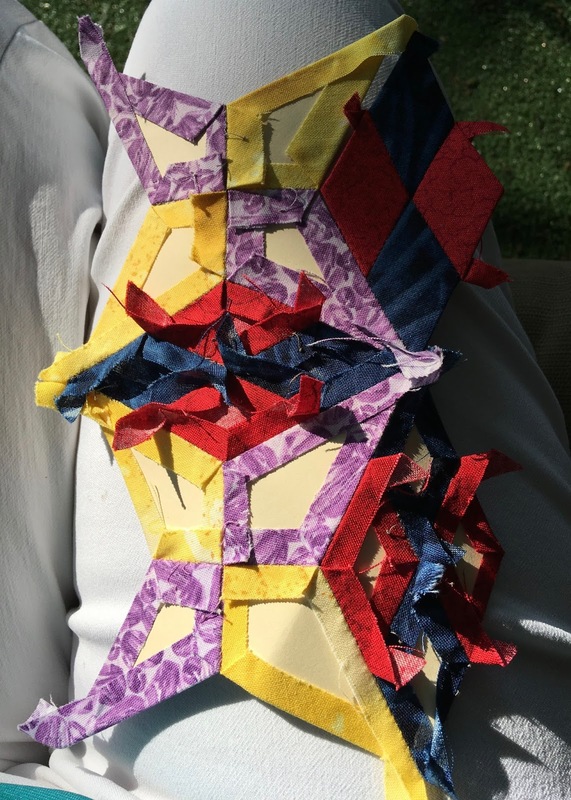 So, in keeping with the using up 2 1/2 inch scrap strips, I’m pairing 4 light and four dark half hexagons for the beginning of what will be a scrappy creation, I hope. 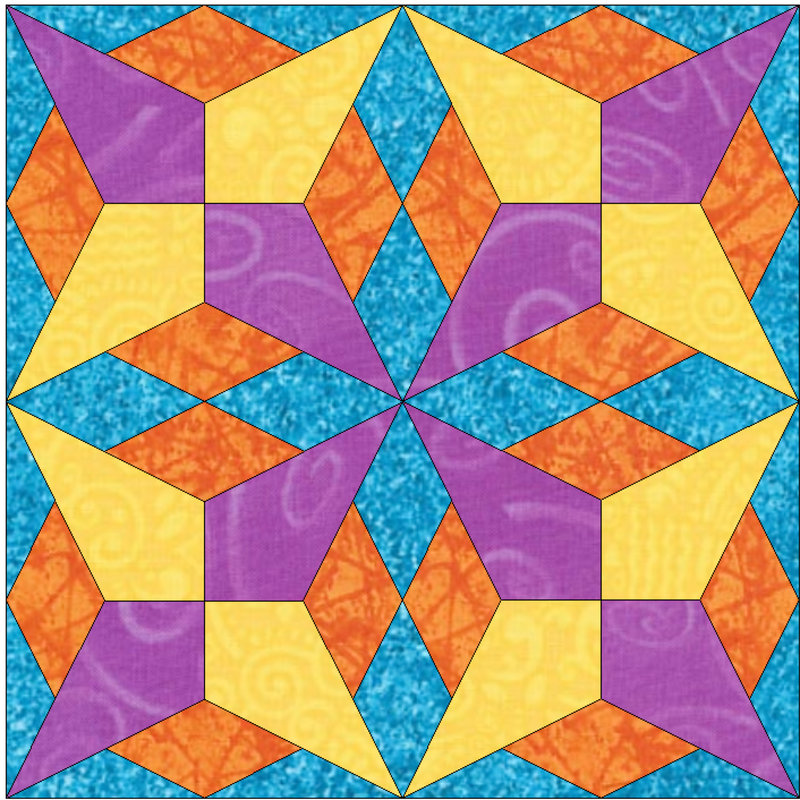 The 2 1/4 inch side of the half hexagon actually goes into the centre, so these pieced hexagons are large, the outside edges being 4 5/8 inches. The other project I’m hand stitching is Leo’s Mane. 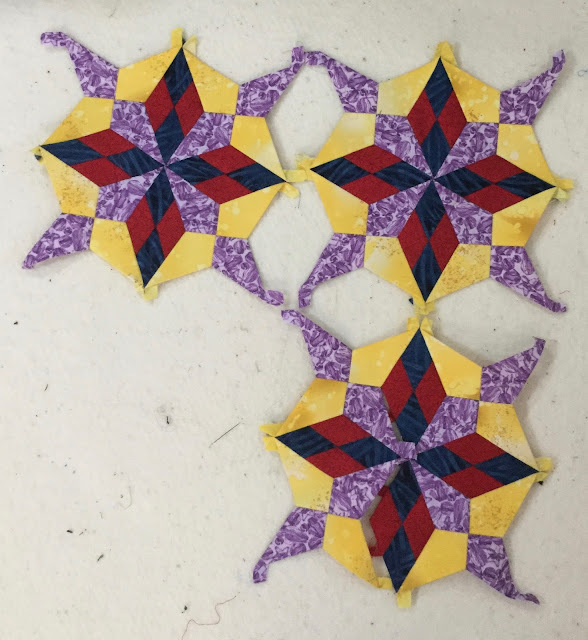 I have 2 more of the yellow and purple stars to do and 5 more of the diamond units to do and then I can start sewing it together. It’s been a lot of fun, and I’m itching to start something else, also using those kits shapes that form the stars. I’m linking up to Kathy’s Slow Sunday Stitching and then I’m going back to more stitching. 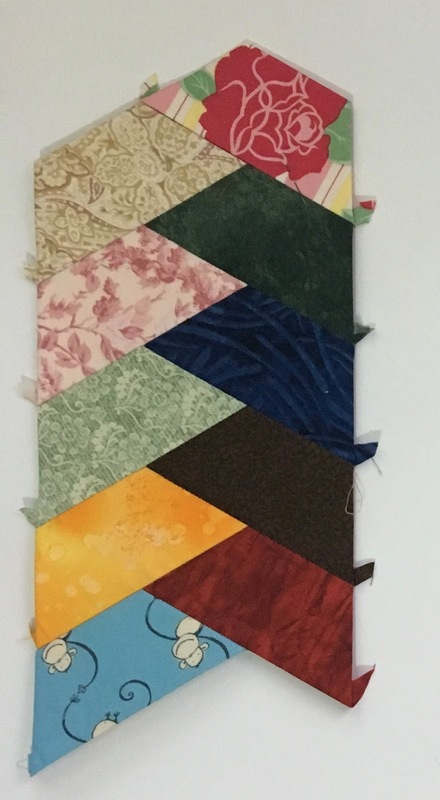 Kathy has a picture in her post today that says “Beautiful things come together one stitch at a time”. So very very true. We had the opportunity last week to spend five days, from Wednesday to Monday, camping in the wilds of Algonquin Park. There were plans for hikes and lots of sitting outside enjoying warm sunny days. What we planned and what happened were totally different. We had a few lovely sunny days, deceptively inviting. What we didn’t anticipate was, according to the people who live in the area, the worst year for black flies that anyone could remember. It’s been a cold and very wet spring, perfect breeding weather for the tiny little beasties. There were swarms of them!! So, we spent a lot of time in the trailer, with the windows open, enjoying the setting from inside the trailer. Any time outside was spent getting to and from the car as quickly as possible. We stopped at a beautiful spot for some quick pictures, and I mean quick. This beautiful spot was just down the road from our campground. So, instead of walks and hikes, there was stitching and reading and sleeping and listening to audiobooks happening. I got a bunch more half hexagons sewn to my braid. It’s about 48 inches long now. I have no idea how long they are going to end up, nor how many I will make, nor what it will end up being. But it’s using up 2 1/2 inch strips and scraps, so it’s a good thing. I also got lots more done on Leo’s Mane. Just one more of these units to make and it will start to go together. All those little diamonds are a bit time consuming, but that’s not a bad thing when stuck in a trailer. Oh, and did I mention that it also poured down rain all day Saturday and all day Sunday? Yep, it did. It cleared up in time for us to come home Monday. Except, as soon as we arrived in the city and headed to where we store our trailer, the clouds opened and it poured again, just long enough for us to get drenched while unhooking and unloading the trailer. Thankfully, it stopped once we got home so that we could unload the car. Sometimes I wonder why we bother with this camping thing. But then, every now and then, we get glorious weather and it is all worth it. I’m linking up to Lorna’s Let’s Bee Social, before settling down to do some more stitching. I think my brain is in overload. In fact, I know it is, and here’s the proof.... I sewed the top right diamond unit on the wrong way. My attempt to slow down by stitching didn’t work very well. Obviously, I wasn’t paying attention to what I was doing. Rats..... time to do some ripping. Why is my brain on overload? The very nice young lady, a friend of our daughter’s who is building our website for us, came over today and showed me how to navigate around. She showed me how to add products and add photos and images and texts and sizes and change things and do all kind of things on the website, so that I can maintain it once it is up and running. My brain is spinning in so many directions at the moment that I can’t keep up with it. But, it is all good and all fun and all worth it. I love learning and doing new things. This is the top part of our home page, what people will see once the site is finished and launched. 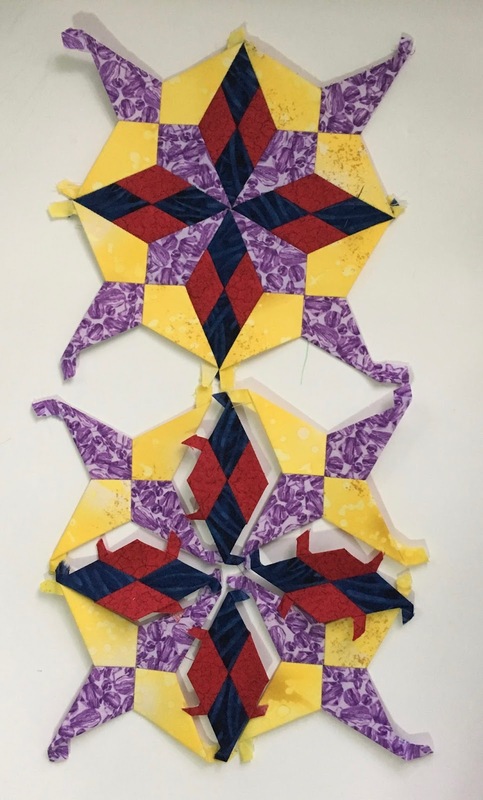 We are probably looking at the end of the month, at which point we will be able to be a supplier for the Canadian market for English Paper Piecing supplies. So very very exciting and so very very scary at the same time!! I am so excited about this new, and first, pattern release I have here on the blog. It’s been a long time coming. 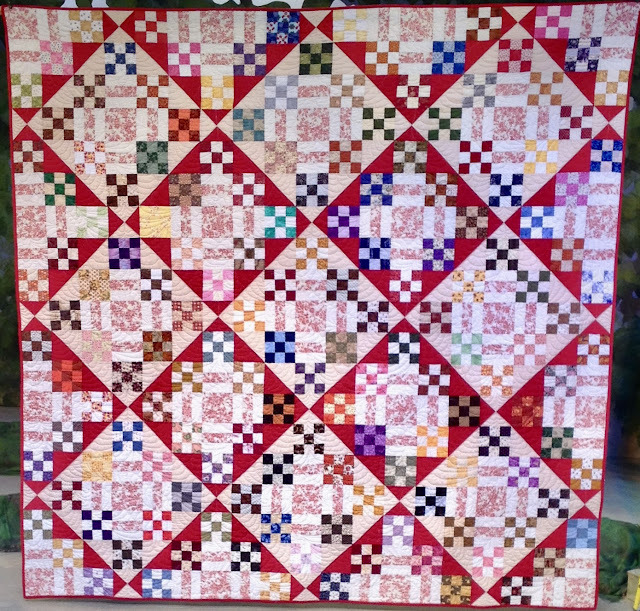 It is a quilt I designed over ten years ago when I was a member of the Yahoo group Canadian Quilt Swappers. This is back in the days before Facebook, before Instagram and even before blogging was common. It has had limited public sharing in a couple of guilds that did it as a nine patch swap and a mystery during their programs. It’s time to see if a wider audience would like to make it, as well. 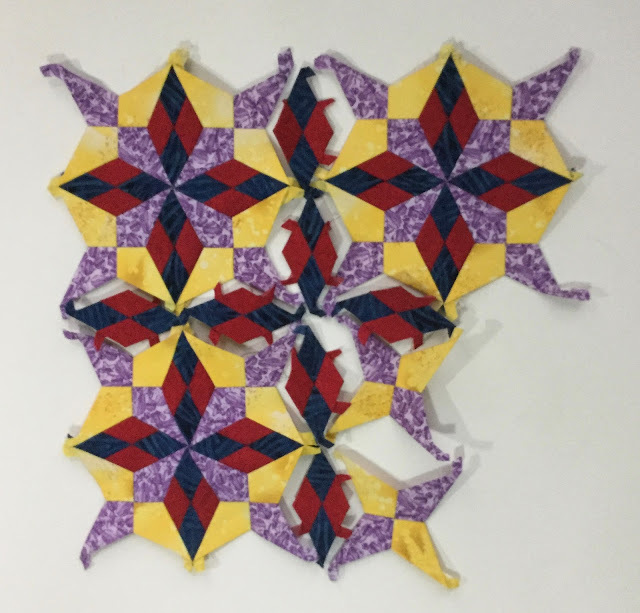 The pattern itself is available on the right hand side bar of the blog as either a PDF download or in print. It is 10 pages long, and has pictures and instructions suitable to a beginner. The quilt looks like quite a complex design, but that is achieved from the layout. The individual units themselves are easy to make. 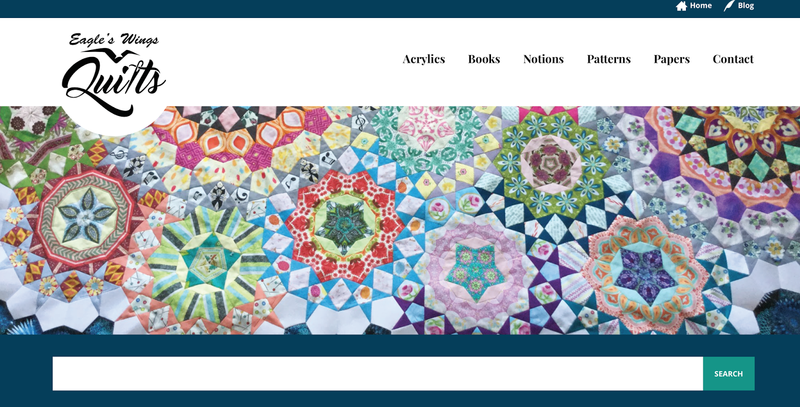 I’m continuing to hand stitch, and in true quilter’s A.D.D. fashion, I have more than one project on the go. Ive started a braid project, made out of 2 1/4 inch half hexagons. They are a perfect fit for scrap 2 1/2 inch strips. And hen I’m continuing to work on the units for Leo’s Mane. 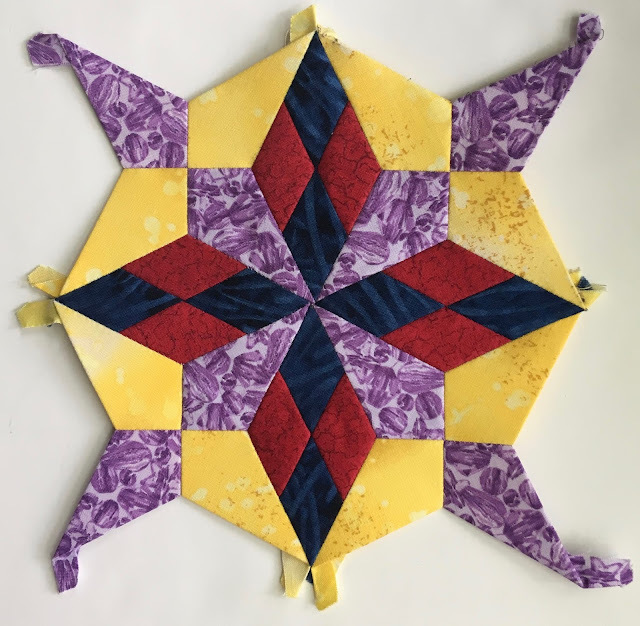 The second of four total stars is ready to go together. Today has been declared a work on the computer day. So, after I share this post with Lorna’s Let’s Bee Social and the Needle and Thread Network, it will be back to work. Last Sunday I posted a picture of my next Hand stitched EPPing project that I wanted to start. I was hoping to find fabrics in my stash that were similar to my Electric Quilt drawing, since I really liked the bright blue and orange. I didn’t have anything in my stash like the bright blue, and since I wanted to keep this as a stash project, I ended up with a plan B. I kept the purple and the yellow, but went with dark blue and red instead of the bright blue and orange. I’ve gotten one of the star units finished, and I think I like it better than the original concept colours. It isn’t as bright and knock you over the head as the original. I’m still really enjoying playing with the stars made out of the kite shapes. This particular design, in keeping with the constellation star theme, is going to be called Leo’s Mane.